Well, town day was great….I know that after a few days in the field, I will never ever take a shower, or the presence of water in more than bottle-sized containers for granted. But, the sun comes up, and camp stirs and once again it is time to get going. So after a quick breakfast of cold cereal, or maybe a granola bar, we fill water bottles and camelbacks, pack sandwiches for lunch, shoulder into our packs, and cram into the pick up trucks. This morning, the teams split up, because I wanted to prospect to see if I could find a site I’d seen earlier, in a previous summer. We park the truck and walk across a grass field, crawling up the face of a weathered bluff. 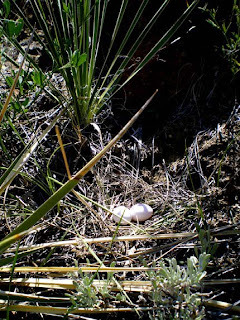 A small bird flew out directly from under my feet as I passed a clump of sharp prairie grass, and there, laying on the ground, was a small nest with unhatched eggs. I probably would have stepped on them if the little momma hadn’t given away their presence with her flight. Birds here have a precarious existence. Many are ground birds, meaning that they nest on the bare ground rather than trees. That makes sense, as trees are few and far between in this dry, harsh land, but it sure puts the babies at risk from snakes, foxes, coyotes, and all the other critters equally desperate to eke out a living here. Hidden nest of the shy prairie ground birds. There are no trees, and their eggs are vulnerable to predators. I took the high path up the bluff, Megan was walking low, and Ben, recovering from heat exhaustion in the quarry, took off by himself to walk out other outcrops. I came around the corner, and there it was, the quarry I remembered. It had been worked illegally, and bones with commercial value taken while others were left. There were fragments everywhere, indicating the possibility of many bones. There were also still big bones, half exposed to weathering, remaining in the wall. 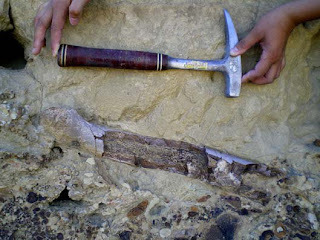 Possible theropod femur remaining in the wall of an abandoned, and illegal quarry. 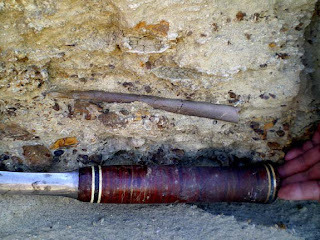 It’s a shame, really, this femur is broken and pretty useless at this point, though if they had been recovered correctly, could have contributed significant information about this ecosystem, underprinted beneath our own recent traces of human culture, familiar yet so exotic. Trapped in the gravel beneath this bone there was another femur (thigh bone), larger still, but in much worse shape. 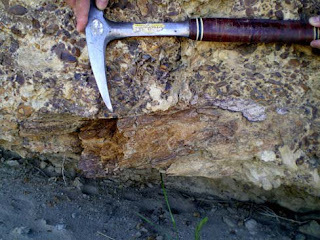 This one might be a hadrosaur, but it is much, much greater in diameter than the above, and resting squarely in a high energy gravel layer. The above has the hallmarks of a big theropod, probably Albertosaur, the ‘Trex’ of this period of time, but the larger one is probably a duckbill---a BIG duck. Theropods are fairly rare from the Judith River, and the find would have been important if it had been properly taken. But the real find from this abandoned quarry is this small gracile bone that I think is the metatarsal (foot bone) of a smaller meat eater—one that is on the lineage to birds. Small, gracile bone, probably metatarsal, of a small meateater, maybe an ornithomimid? It is a beautiful bone, almost complete. This one might be a first, but there is no other evidence at this point for any more of the animal…and this one is not so diagnostic without some additional material. Still, the importance of finds like this is that it documents, at least at some level, the presence of these guys, living together…the first step in understanding the ecosystem and dynamics of this not-well-studied time. When I first saw it I figured it had to be a hoax. Either that, or I was dreaming. 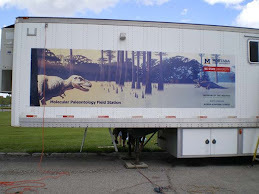 What you are doing with dinosaur fossils is tantamount to resurrecting a book from a pile of ashes. This is science that is as significant as men on the moon! You ARE receiving the Nobel Prize for this, aren't you? What amazes me the most about your work and discoveries is that I had never heard a thing about any of it until I stumbled on it by accident. Why was this not front page news? At any rate, I thank you for your immense contribution to science and to our understanding of paleobiology.